Kites are quite vulnerable. They get a lot of beating from the sand, sun and water and get worn out quite quickly. Generally kites are replaced sooner than for example boards. What if we could protect our kites a bit better and make them last longer? Or what if we could leave our kites protected on the beach in between two sessions without deflating and pack them? 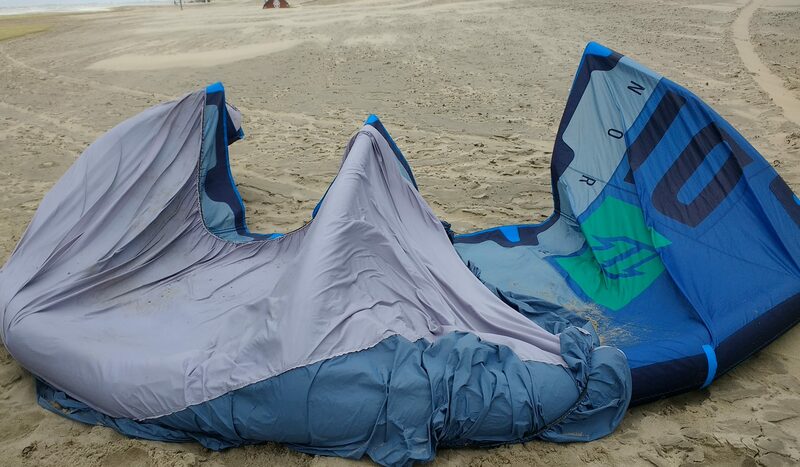 Or keep an extra kite on the beach in shifting winds to make sure you can quickly change to another size. This is exactly why the Kiteshield has been invented. 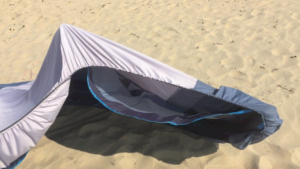 The kiteshield is a cover to put over your inflated kite on the beach to protect it from UV, sand and about everything you put your kite on. But does it really work when it is windy? Does it stay on the kite even in strong winds and are we able to get it on without too much hassle? 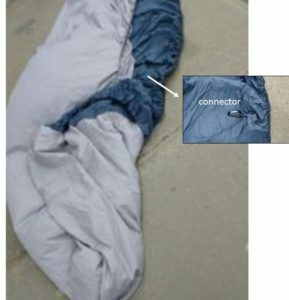 We already got one of those Kite covers and tried it. The idea is great for some purposes, but the product needs some evident changes. When we saw the announcement that the Kiteshield was up for a fundraising campaign we thought the idea of such a product can have a lot of potential. When we announced that we were going to test it, a lot of reactions tended to be quite sceptical. On top of that no money at all -so far- has been raised. Both are a surprise to us. The cover is just around 50 Euro’s (35$ US during the fundraising campaign). 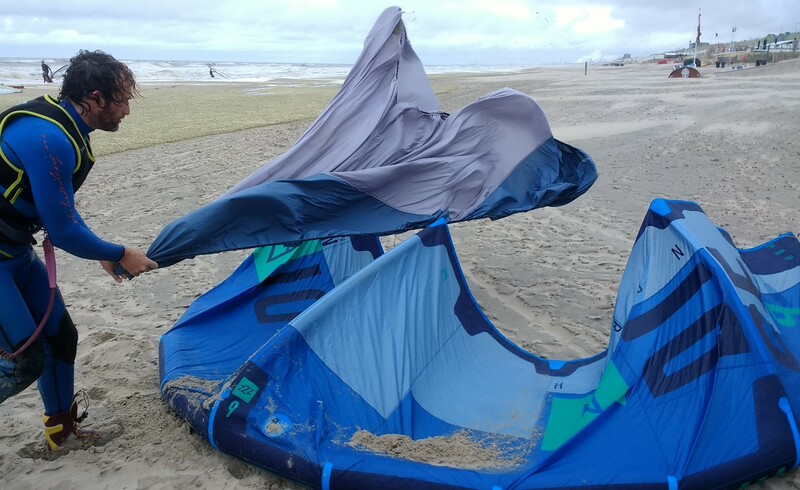 A 1000+ Euro kite may just last a bit longer, protected from damaging UV sunlight, abrasive beating from sand flying around and doesn’t get coloured from the green dead algae on the beach, just to come up with a few advantages. Anybody that has been kiting on -for example- Canos the Meca (Spain) knows the sound of the rough sand hitting the leading edge in 30+ knots winds. The wind goes up and down often during this gusting levante wind which is typical for this area, and switching kite sizes is needed quite often. How convenient it would be if you didn’t need to worry about your inflated kite on this beach?! How often did you deflate your kite and decided not to inflate it again just because the rigging again would be to much of an obstacle? At our test site (mostly the Netherlands) we hardly have any high UV days so we had to see how kiters in other countries look to the idea of using the kite cover. We happen to be in Curacao in the Caribbean for a few days and asked owner and kite instructor Nick from Nix Kite School about it. We showed him the cover, how to put it over a kite. Curacao generally has mild winds (around 20 knots), so it was just a matter of seconds to put it on Nick was immediately thinking about his own sessions. First rule for him in these constant incredible hot and high UV beach; get your kite packed straight after your sessions, even when going out soon again. He explained a lot of kites suffer from leaks and wear out due to the beating conditions. I see a lot of leaking kites, mostly due to the glue which can’t stand the heat and the sun. Finally it looks like I can leave my kite on the beach in between sessions. Although the heat won’t be gone totally, at least direct sunlight is avoided. He was clearly happy and excited about the cover. We own 4 kites, have a lot of test equipement and actually used it a lot to protect our kites when shifting from one to the other. It was interesting to see a funny side effect of the cover.Other kiters started to ask what was underneath the cover. It leads to interesting conversations and it definitely has a commercial potential when you would put your logo (kite school for example) on it. 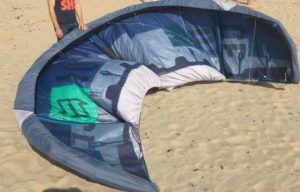 At the moment it is possible to get such a print in a -quite modest sized- 60*40 cm in the middle of the kite for a couple of Euro’s. It is a bit small, and probably quick too change up on request. The cover is far from a perfect product. For example it came without a proper box and instructions. Which makes it impossible for example to give it as a birthday present to a fellow kiter, for example. (he or she would be guessing the first minutes what you just gave, which would be a bit awkward ). The concept of having a quick and easy protection is good, but some details could be improved. For example a better and big colour indication where the connecting part is. The connecting clip connection was too weak. When we tried to connect it in stronger winds the clip connection broke. It needs some refinements on these points. The good news is that the cover has no problem staying on. 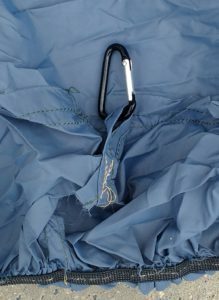 Even in bigger winds (we test it until 30 knots ) there is no sign of the cover flying away. It may need a bit of sand on it, but it isn’t any different as having your kite on the beach without the cover. We got a 9m sized cover, which can cover still a 10m (North Dice) and of course smaller ones. The 11m wouldn’t fit anymore. It means customers are likely to order different sizes, which makes it important to make distinguished colours and indications for each cover size. At the moment it seems they are all the same. If you just want one it is very logic to take the biggest size. The absence of a decent package including instruction, website, webshop and social media sits in the way of a product that would be appreciated in near equatorial countries (UV!) and rough and very windy sandy beaches. But we are convinced it will get there, the idea is spot on for these area’s. Good one. We never saw this website before. 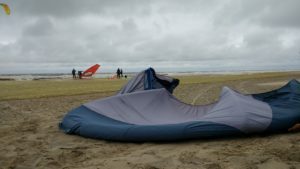 You might also want to check out – kitecovers.com who already have a similar product on the market, however with removable panels to enlarge the cover making it fit for multiple kites.